Following my first ever article for Rejects which talked about the medical aspect of tattoos, now it’s time to talk about the aftercare involved when getting a new tattoo. I mean about bloody time I decided to write this article. Everybody loves taking care of his beloved possessions and sometimes we tend to mess things up or end up giving the wrong attention needed. As much as you get inked, the looming question will always knock at the back of your head: Am I taking care of my tattoo properly? Well no worries, normally for experienced people, their track record of tattoo aftercare can be followed on the previous ones. If you made a mess of the others before it, well you definitely need to change your routine. I remember my first tattoo where my borderline OCD developed into keeping the tattoo in tip top shape with routine cream applications and inspections done minimally four times a day. 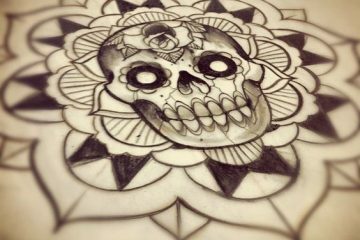 The first step in order to obtain a good result is to choose a clean, certified tattoo artist who you trust. Referring to previous works done by the artist and also choosing the artist depending on the style they excel in will be a major contributing factor for the end result. For example opting for a tattoo artist who excels in tribal tattoos to have a detailed skull on your forearm is not a very good choice. Every artist has his best options and weak options. Always take your time and never rush into a decision. It’s also very healthy and beneficial to discuss different options with the tattoo artist since their eye for detail may help to make it better. At the end of the day the choice is yours and the end result will reflect a good choice or rather a horrid one. There is a wide variety of aftercare routines adopted by people to ensure the best end results. 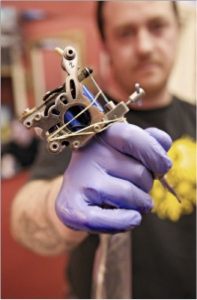 These adaptations will definitely include the speed, cleanliness and method to obtain the best result for your tattoo. Definitely, the tattoo artist will play a vital role in this phase. Suggestions given by the tattoo artist on tattoo maintenance should be noted and adopted. It’s also very healthy to maintain an open contact with the tattoo artist to ask and address further issues which arise in the coming days. At the end of the day remember that a good result doesn’t only reflect your choice but also the tattoo artist’s work. It normally takes 7 to 10 days for a tattoo to heal properly. Obviously, exceptions always take place. It’s very improbable for a tattoo to heal before 7 days but it is common for it to heal well beyond 10 days. 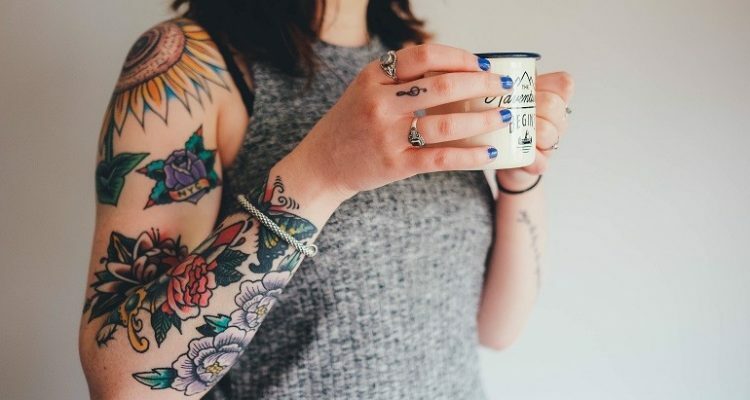 In cases were the tattoo appears to be healed, my advice would be to always spend a period of 10 days tattoo aftercare to avoid any potential risks. When a tattoo artist finished the work or session on your tattoo, they will normally wipe the tattoo with green soap or apply an antibacterial agent, vaseline or another hydrating agent and cover it with a bandage. Bandages are rarely used nowadays, as applying thin plastic film wrap on the fresh tattoo has proven to be the best dressing option. So yes always opt for plastic film wrap. 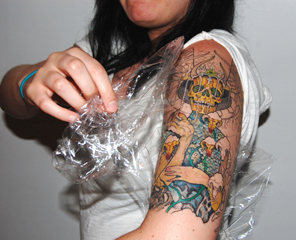 Besides being cheaper, plastic film wrap is easy to apply and applies gently on the tattooed area. Also, upon removal of the plastic film wrap, the tattoo ink will not stick to it as opposed to the bandage. 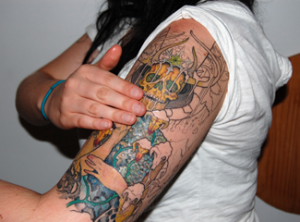 The film wrap should always be kept in place with medical tape in order to avoid friction on your tattoo. Also very importantly, anyone allergic to medical tape should opt for hypoallergenic tape which can be easily bought from pharmacies. Allergic reaction to the tape would present as red swollen areas on the site of the medical tape. Caution is always advised. As I already pointed out, tattoo artists especially in Malta, use the typical antibacterial cleanser such as green soap to sterilize the area before and after finishing. It is always strongly advised to confirm with your tattoo artist to use such agents rather than antibacterial creams, since application of such creams in certain cases can result in overdose. It’s difficult to come across anyone using antibacterial creams but caution is always strongly encouraged. Once you leave the tattoo parlor, there’s no need to continue applying antibacterial agents. Keeping in mind that yes, tattoos are still prone to infection, following proper hygienic routines will prevent any risks of infections. Why is it so important to keep the tattoo covered at first? As already described, the tattoo is technically an open wound. By the time the artist is finished, the skin needs a few hours to recover from the trauma. Keep in mind that getting tattooed involves severe trauma to the first layers of the skin. Hence why the area is tender, swollen and painful. The bandage/plastic film wrap protects the skin from air borne pathogens which can cause infections to the skin. Leaving the area covered for 4 to 6 hours, would allow the sterilized area to remain hydrated and recover properly. NEVER leave the plastic film wrap for more than 6 hours. A plastic film wrap doesn’t allow air/oxygen to make contact with the skin and although it helps the skin to recover, exposing it further than needed will provide your tattoo area to become a potential candidate for fungal infections. 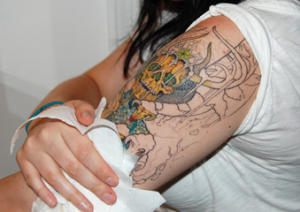 After removing the plastic film wrap, it is advisable to clean the tattoo to remove excess products and coagulated blood present on the tattoo. Always use a mild, non exfoliating, preferably hypoallergenic soap to clean the tattoo to avoid exposure to harsh chemicals. Gentle rubbing should be applied to clean the area well and most importantly never expose the tattoo to a strong shower spray as this may damage the skin and affect the tattoo. Washing your tattoo with warm water is better than washing your tattoo with hot water. Hot water opens the skins pores causing ink to ooze out and thus losing some of the tattoo’s consistency. Exposure to cold water for a few seconds after washing would help the skin pores to close and maintain the desired tattoo consistency. Gentle patting to dry the tattoo also helps avoid damage to it. This procedure should be repeated for at least one week. Everybody has different opinions. From my experience interacting with people with fresh tattoos from the pharmacy, has helpe d me set up the routine I use when treating these new fresh areas. People always ask what cream can be applied on the tattoo to retain consistency. Honestly there are several creams which can be used. I shall mention the most popular ones, in the end everyone is then entitled to choose his own desired product. Biafine: A hydrating cream normally used to treat light burns on the skin. Proven to give good results with tattoo care but sometimes people complain regarding colour consistence. Bepanthen: A nappy cream used to avoid nappy rashes. This cream forms a protective layer on the tattoo to help the healing process. It is a highly recommended product but application of this product also causes heavy scabbing. Baby oil: Also used to keep the area soft and hydrated. Does not allow any forms of protection for the tattoo. Not recommended. Zinc and Castor oil: Definitely no. Only aids minimally in hydration and offers no sort of protection whatsoever. Preparation H: HELL NO! Preparation H is used for hemorrhoids not tattoos. It has a totally different function so don’t you even dare to think about it. My definite choice would be on rather bepanthen or biafine. Tattoo artists normally recommend either one or the other. Both are good products which provide good end results. It all then depends on the care given. These creams should be applied six hours apart, three times a day for at least one week. Apart from those, I normally recommend the application of a moisturizing lotion on the tattoo at least once or twice a day between the six hour intervals to maintain a complete hydration throughout the day. The tattoo healing process might cause itching. There are several moisturizing lotions on the market. Vaseline: Not recommended as the petroleum jelly present in the product might clog the pores. QV: Not recommended since it contains parabens which might affect the tattoo. Oilatum: Not recommended since it contains parabens which might affect the tattoo. Lipikar AP: Recommended since parabens free. Normally used to treat pruritic irritations in children. Dermaveen Moisturing Cream or Lotion: Highly recommended since parabens free. Normally used to treat dry skin conditions, the presence of collodial oatmeal in the product helps give the natural edge upon other products. Aloe Vera: Not recommended. I’m not a fan of Aloe Vera containing products. Although it’s used for practically everything, I still won’t recommend the product. Other Moisturizing Agents: Definitely not recommended. Fresh tattoos should be given as much air as possible in order to speed up the healing process. 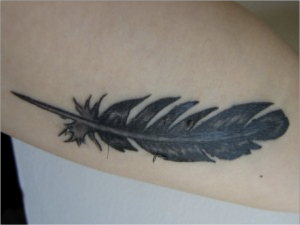 In the first few days, keep in mind that your newly fresh tattoo will tend to stick to your clothing fabric. For the first week, tight clothing should be avoided at all costs. This also happens during bedtime. Although it isn’t an alarming situation, it surely is annoying. This can be easily avoided by applying a small amount of baby powder on the tattoo. Baby powder won’t affect the tattoo healing process. When a tattoo is in the middle of its healing process, the tattoo will start to peel. That’s an indicator that the healing process is progressing well. It’s imperative not to scratch the tattoo during this process or try to peel the layer off. This will only result in bad infections and loss of colour. The scab formed clears off naturally whilst taking a shower. As already noted before, scrubbing the area to remove the peel formed is a bad practice. In such cases, itching will be present and it’s not gonna be a pleasurable itch. always resist the need to itch cause you might spoil the healing process. Scratching may cause damage to the already inflamed, tender skin, making it more prone to infections especially if touched by unclean hands. Application of a moisturizing agent as indicated earlier on will help ease the itchy feeling. 1) Swimming – Swimming in pools, the sea or just laying around in a jacuzzi can be harmful for your tattoo. It’s well known by the general public that these areas are havens of bacteria and other microbes. During the first week the tattooed area is more prone to infections and exposure to such situations will only further increase the chance to spoil the result. 2) Sunlight – Before going in direct sunlight both whilst healing and when healed, tattoos should always be covered by a good sun screen. There are several sun creams available, I personally find La Roche Posay to be the best one around. 3) Saunas – Whilst the tattoo is healing it’s not a good choice. Like when having a hot bath, the high temperature will cause the skin pores to open which will result in a loss of ink. 4) Pets – Emphasizing about cleanliness is never enough. Never let pets lick or touch the fresh tattoo area as you are exposing the risk for a severe infection. Be patient until it heals. Afterwards you can do whatever you want with your pets. e that happens in the bedroom can cause problems for your healing tattoo. The best option when getting tattoo is think to think ahead and plan. Especially if your a sun loving crazy person who needs to go on long adventures in summer should consider the option of getting a new tattoo in the winter. Besides surely having 95% of our body covered, this would greatly reduce the risk of tattoos getting exposed directly to sunlight and avoid any potential swimming risks. Getting a tattoo is a huge responsibility. The end result depends mostly upon you. Even the best tattoo artist in the world can have his best masterpiece ruined with negligence. I hope you find this article useful and use it as a future reference.